From Llanfairfechan it is little more than a stone’s throw up the valley to Llanllechid. Stone’s throw is possibly appropriate description here, since the old residents of the village would have been quite used to stones flying round. 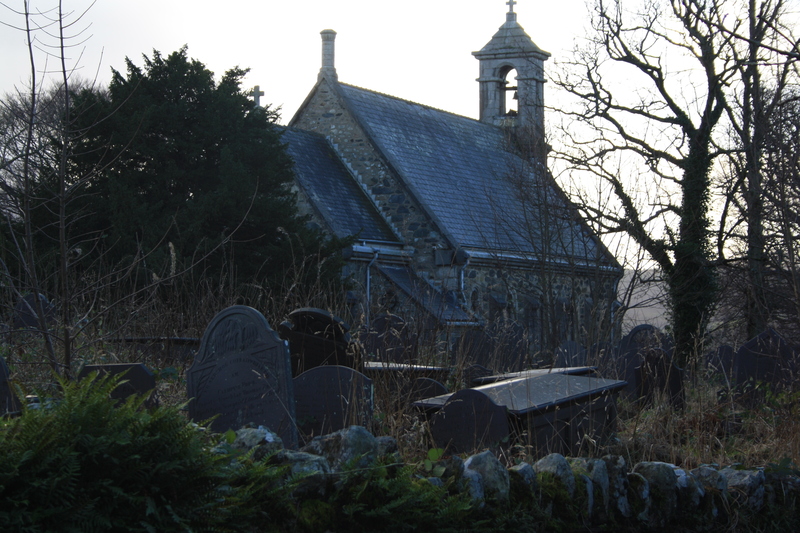 The church of St Llechid has such a legend attached to it. The story being that the original plan was to build the church some mile away, close to the site of the well, but each time the work began the stones miraculously transported themselves overnight to the place where the church now stands. This was repeated daily until the masons got the message that they were building in the wrong place and changed their plans accordingly. This legend is quite common, attached to a number of churches across Wales; indeed we recounted the same story at Capel Garmon not that far away. The present church, largely rebuilt in the nineteenth century, has not been used since 2002, other than as a picnic site – as we found on our visit, surprising two hikers sitting eating on the doorstep. Llechid came originally from Brittany, one of a family of saints who travelled widely across North Wales. She was sister to Trillo who has a number of churches and wells dedicated to him in the area; as well as of Tegai, Gredifael, Fflwyn and Rhedyw. Llechid’s feast day is given as either December 1st or 2nd. Llechid’s well stood by the side of the old road from Llanllechid to Aber, about three quarters of a mile from the village. The well was noted as a healing well. Many claimed complete cures using it to treat skin disorders. Fardd tells us that “…so great was their faith in it that people would call for a drink of its water when at the point of death”. At one time a chapel stood beside it, Capel Llechid known locally as Yr Hen Eglwys. Hughes and North record that in 1780 the chapel was quite complete, although missing its roof, and that children would use it to play churches. It measured around 16 feet by 8 feet. However, the stone was robbed for building and by the start of the twentieth century only the foundations of one wall remained. baring Gould and Fisher place it near to the fields known as Cae’r Capel and Cae’r Bettws. The site today is recalled only by the presence of the cottage Cae Ffynnon in the middle of a field on the right hand side of the road. The location was not recorded by the Royal Commission and does not appear on any maps of the last 100 years. Neither can we find a description in any other publications. 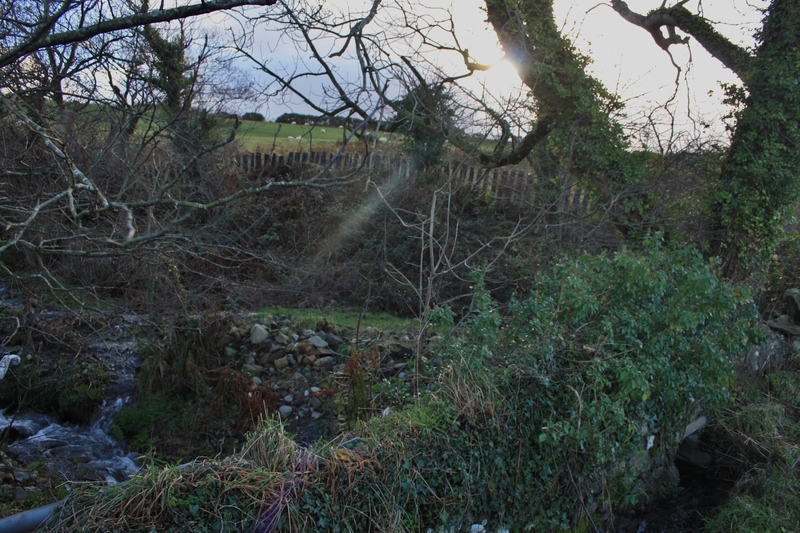 So the only readily available source is Hughes and North who state that it is “… a few yards to the right of the road, just before you reach a little stream that flows past Cae Ffynnon”. So, almost certainly putting far too much faith in one single 100 year old guidebook, we walked out of Llanllechid totally expecting to find a clear and obvious spring by the roadside. This approach often ends in disappointment. In the end we identified two possibilities. The site in the small copse shown below, which certainly lies close to a little stream. The area was wet, and may well have been aq spring, although recent rain had led to quite a bit of flooding in the area. The other alternative is in the field below Cae Ffynnon. A rectangular area grouping of stones seems to shout out – “here is the remains of the chapel, miraculously returned” although we know this is long since lost. Beside these is a brick built chamber, again surrounded by water, which, with faith, may well house a spring. Both of these are based on guesswork on a wet day. 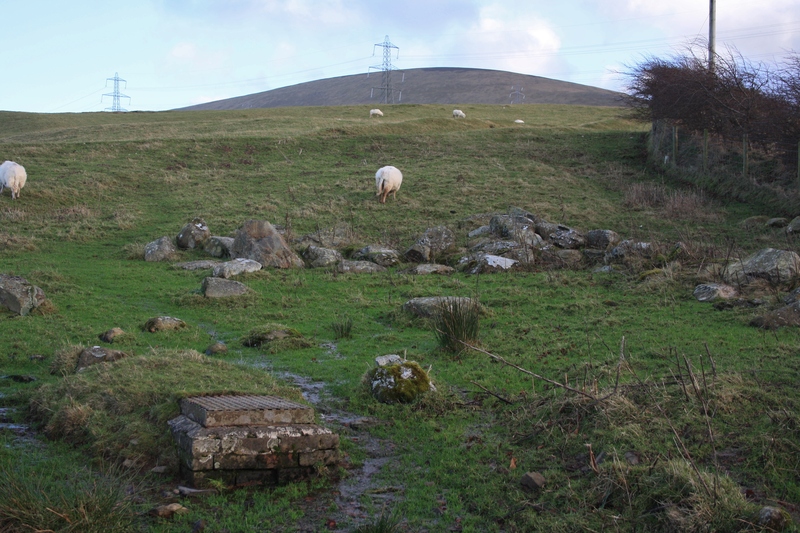 The maps do show a couple of springs in the area of cae’r Ffynnon, but both are in the middle of fields at some distance from the road. We are certainly in the area of St Llechid’s Well here but by no means certain we identified it , as always, any more accurate information will be gratefully received. Only been subscribed for a short time to your blog but really enjoy all your posts. Wonderful evocative photos and fascinating information regarding the history and legends of the wells. Thank you for sharing your discoveries ! I was told by the farmer from the adjacent farm that the well was capped for a water supply and is in the field by the cottages, Cae Ffynnon. My neighbour, now deceased, told me many years ago that they used walk to the well which had a roof over it.